Feminine, pretty and flowy modern Japanese wedding dresses for bridal fashion inspiration. Japanese Bridal House Bibi's original Kimono Couture collection features modern-cut gowns with elaborate twists, turns and textures. Check out some of my picks below. Wedding gown with multi-colored floral lace texture, a chiffon sash and skirt overlay and scattered silk rosettes. I love the unexpected details on this sophisticated gown. Blush pink Princess-line wedding dress. 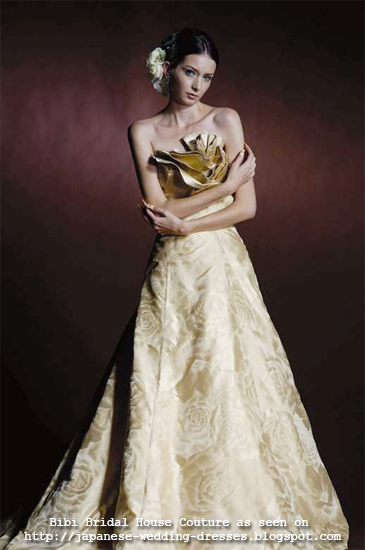 The bodice is adorned with a chiffon rosette and the skirt is overlayed with bustled chiffon. 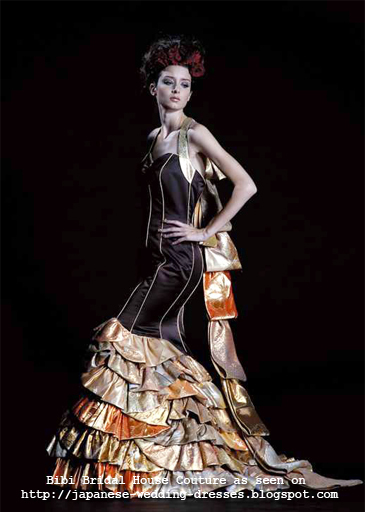 A-line dress in gold kimono fabric. I love how the fabric layers on the bodice opens up like petals on a flower. 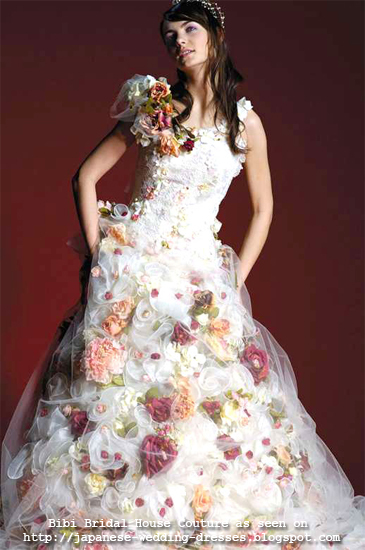 Princess-line wedding dress covered in lace flowers and multi-colored fabric rosettes. Funky and romantic at the same time! A modern take on the kimono wedding dress. Another fresh take on the kimono wedding gown. See more on Bibi Bridal's website. Due to the language barrier, it's a shame that Japanese wedding dresses beyond the kimono aren't readily visible to the Western world. This blog aims to showcase bridal gowns by Japan's designers in all their beauty and splendor -- in easy-to-read English. * Thanks go to the stack of Japanese wedding magazines that helped me in my own wedding-planning for exposing me to Japan gown design, and to my Nihongo-speaking brother for helping with some of the translations. DISCLAIMER: This page shares information in the name of love for weddings in general and does not earn from any purchase of the dresses it showcases. It instead generates some income based on affiliate relationships with select retailers including Amazon and Google among others.